The following questions are the most frequently asked questions about the National Drug Helpline. If you have questions that are not answered by the following, you can contact us anytime. What is the national drug helpline? The National Drug Helpline is an organization dedicated to helping those struggling with substance abuse and addiction. The National Drug Helpline strives to make hotline numbers accessible to anyone in need. You can read more about The National Drug Helpline on our About page. Calls to the phone number found on Drughelpline.org are sent to one of our partners that is dedicated to better helping people find and talk through their treatment options. Our partner can help you to find substance abuse treatment, if you are ready for it. If you aren’t ready for it, that is ok. Our partner can assist you even if you aren’t ready for treatment. Our partner is a for profit organization and so is Drughelpline.org. Substance abuse treatment is a great solution to potentially recover from any addiction you or a loved one may be facing, but do not let anyone push you into treatment if you are not 100% ready for it. Treatment is a big financial, health and time commitment, so make sure you are the one that is ultimately making this decision and not someone else. Our goal is to alleviate the overwhelming call volume going to SAMHSA and to prevent those who are struggling with addiction from being admitted to an unethical treatment facility. If you are interested in partnering with The National Drug Helpline or would like to know more about our cause, please contact us. Drughelpline.org is operated by an organization that is dedicated to making substance abuse hotlines and substance recovery resources available to those who are in need of help. We are not associated with SAMHSA or any government organization in anyway. We are not a non profit organization. We are not a professional medical advice resource and users of our site should not use the content found on our site as professional medical advice. Please see our site wide disclaimer for more information. We are National in the sense that our helpline is dedicated to helping those residing in the United States. We offer help to those across the nation. We are not a government organization or entity. Our organization is a grassroots effort that is self funded and for profit. If you are looking for a government organization that can help you or a loved one with an addiction, please visit the SAMHSA site. Why don’t I just call samhsa from their site? You can definitely call the SAMHSA phone number from their site and should call SAMHSA if you would like help from a federally funded organization associated with the United States government. We advise that you try calling them before calling us, as they are a government organization and have great resources. Drughelpline.org is an alternative resource provided to those in need. You can access the SAMHSA website by clicking here or you can call them at 1-800-662-HELP (4357). We aim to provide as many resources as possible and want to alleviate the volume of calls that other organizations receive in order to reduce treatment times. We also strive to protect those who are seeking treatment from unethical treatment centers. Is this site affiliated with samhsa? No, Drughelpline.org is not affiliated with SAMHSA in anyway. We are also not affiliated with any government or federally funded organization. We are not associated with any organization mentioned on our homepage or anywhere else across our site. We are a private, for profit, self funded organization. If you are looking to contact SAMHSA or a government organization, click here. You can also reach SAMHSA at 1-800-662-HELP (4357). Is this site a non profit? No, Drughelpline.org is not a non profit. Drughelpline.org is for profit and we are compensated for the work we perform. Although we monetize off of this site, we are still thoroughly dedicated to helping those suffering with addiction and substance abuse. Compensation we receive helps to support the costs associated with operating the Drughelpline.org website. If you are attempting to remain as anonymous as possible, it is recommended that you use Incognito searches (Google Chrome), Private Tabs (Mozilla Firefox) or Private Browsing (Apple Safari). Also, you can clear your cache and search history if you opt to use standard browsing. Lastly, be sure that your internet connection is on a private network. Can I call for someone else? 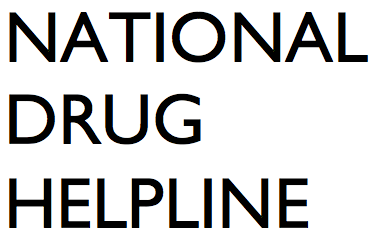 Yes, The National Drug Helpline and Drughelpline.org exist to provide resources to anyone. You can call the helpline for someone you are concerned about and for a loved one. You don’t have to have a substance abuse or addiction problem yourself to call the hotline. The National Drug Helpline typically operates 24 hours a day, 7 days a week. On occasion, our helpline is not staffed due to holidays or other personnel limitations. If your phone call is not answered, feel free to call us back. We strive to answer every call, but call volumes, budgets and other restrictions prevent us from answering every single call that comes into us. If we aren’t answering, try giving SAMHSA a call at 1-800-662-HELP (4357). If you are experiencing a medical emergency or any type of life threatening situation, call 911. Do I need insurance to call the helpline? No, insurance is not required to call the helpline. The helpline is toll-free. If you decide to go to treatment after you call the hotline, you will most likely need insurance or you will have to pay out of pocket. Yes, your call on the hotline is 100% toll-free. However, standard message and data rates may apply from your provider. As mentioned above, if you decide to seek treatment after calling our helpline, you will most likely need to pay for this treatment. Unfortunately, there are very few free addiction treatment options that exist. is this content professional medical advice? No. Any and all content found on Drughelpline.org is not professional medical advice. As mentioned in our site wide disclaimer, content found on Drughelpline.org is designed to discuss general topics related to addiction treatment. The function of this site is to post relevant articles that we feel are relevant to addiction treatment. This content should not be taken as, or replace, advice from a medical professional. Please consult a medical professional for any health related concerns and a financial professional for any monetary concerns. Content found on Drughelpline.org can potentially come from multiple and various sources at anytime, including aggregation, curation and modification of content from third party websites. We are not responsible for this content and we do not take any credit for this content. We have made a good faith effort to include links to the original sources of any aggregated, curated and/or modified content from external parties in order to abide by US copyright laws. If you find a piece of aggregated, curated or modified content on our site that belongs to your business/site and is missing a source or reference link, please contact us here and we can correct any error. We can also remove the content upon request. If you are experiencing a medical emergency or any type of life threatening situation, call 911. Do not reference the content found on Drughelpline.org as professional medical advice at any point, especially in the case of an emergency. What If I Have Other Questions Not Answered HEre? If you have any questions at all related to Drughelpline.org; including questions about our organization, where calls go or our content, please contact us. Our goal is complete transparency and we strive to operate a hyper ethical substance abuse hotline that can help people across the nation. If you are experiencing a medical emergency, overdose, health crisis or an other urgent matter; CALL 911 IMMEDIATELY. The National Drug Helpline is not the appropriate phone number to call when experiencing any kind of life threatening situation.